When you have patrons clamoring for better access, you need to direct your attention to improving the experience of linking to content. Your link resolver should not be taken for granted. It is a critical component of your library’s discovery strategy. A new 360 Link user interface with integrated Index-Enhanced Direct Linking that improves linking reliability and eliminates the most common confusion points for end-users when linking to full-text content. More than 300 libraries are leveraging the latest 360 Link innovations to improve linking for end users. 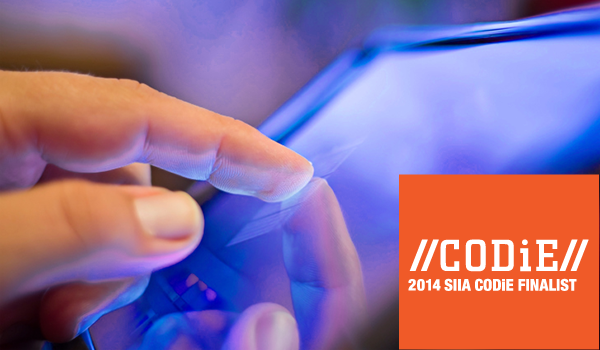 Our approach is centered on leveraging today’s technology, not yesterday’s, to improve the user experience. Your users have the best opportunity to gain access to content through the most complete, accurate, and up-to-date knowledgebase available. The 360 Link knowledgebase delivers the highest number of links and the most accurate links to ensure users are connected to your valuable resources. You want to make the complexities of research easier for your users. With 360 Link, quickly and easily connect users to full-text content within your library collection and link to extended resources for advanced research. 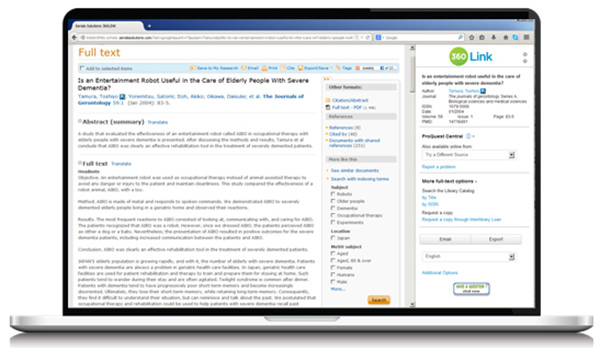 360 Link interoperates with your discovery service and ILS, while integrating with Google Scholar, PubMed, subscription databases and other resources to ensure users get to desired content. Also includes seamless integration with citation management tools and provides custom linking options. 360 Link delivers results as you want and as your users want them to render - unbiased and comprehensive. The customization options we provide helps you configure the discovery experience, ensuring resources are prioritized in the manner you want. 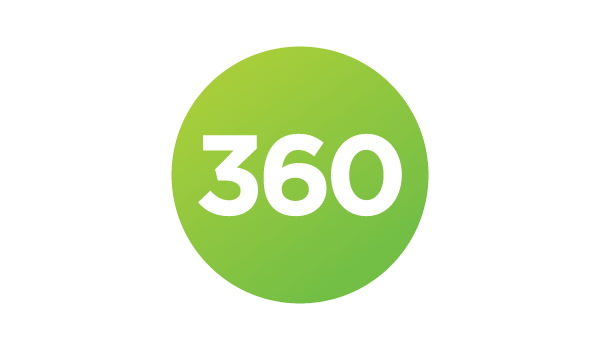 360 Link contributes to your mission of providing users with hassle-free access to the information that they seek during the research process. With superior access to content, users gain confidence that the library is their partner in research. 360 Link does more than just provide access to full-text. You can increase users’ information literacy-skills, while introducing and linking them to librarian-recommended resources to extend their research abilities. In addition, you can also provide access to obtain help. 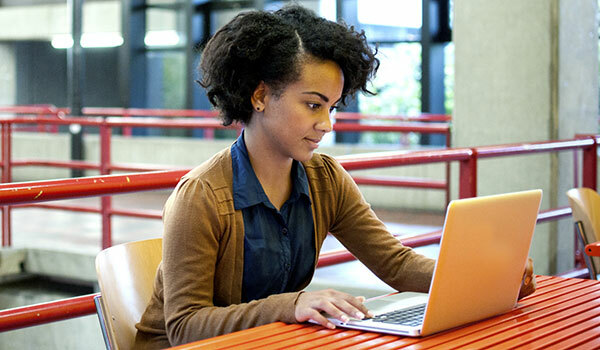 The authoritative ProQuest e-resource knowledgebase provides accurate, up-to-date connections and eliminates missing links. Tracking journal holdings in one unified knowledgebase, your users experience a superior linking experience with minimal workload on library staff. 360 Link is a SaaS service that can be quickly customized, configured and implemented. There is no need to manage backups, worry about maintenance, or update servers. You can also take advantage of constant metadata updates, rapid technology deployment, and easy integration with other services. 360 Link is highly customizable. You can bring your institution’s branding and navigation into the discovery environment, present linking options, and modify the display, text, and buttons and labels. Those seeking flexibility can use a full-featured API or a 1-Click to Article option. 360 Link enables you to deliver the most relevant user experience and best linking experience for your library and its patrons. Through combination of the knowledgebase, technology used, and customization options users seamlessly access desired content. You can gather and analyze usage statistics to evaluate user behavior between your resources and 360 Link. Reports include click-through metrics and referral reports, which show how many times users are coming from which referral resources. 360 Link has a strong user community. You can join listservs, attend live online training with other users, or participate in a live user group to optimize your discovery experience, share ideas and provide feedback. Accompanying these user-oriented activities is the unlimited training and support provided by ProQuest.